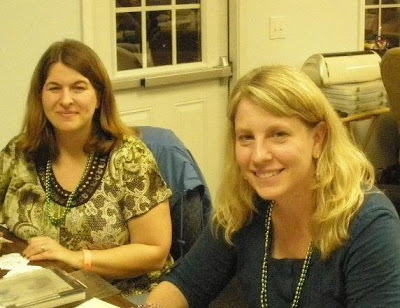 Donna's Crafty Place: Fun Crafty Weekend! Hi Everybody! I haven't posted in a few days because I had a really busy weekend. The Stamp and Scrap Art Show came to Columbia to a location about 10 mins from my house! My online friend Libby Hickson aka Stampinlibby decided on Thursday night to make the 4 hour drive from Atlanta and go to the show with me Saturday morning. So we shopped all morning. Our favorite place was the Stampers Anonymous booth and we enjoyed meeting Ted Cutts. 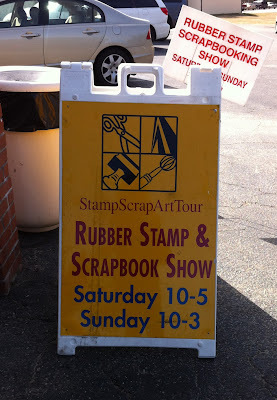 After the show we went to The Stamping Place and Scrapbook Station which is my local stamp store. 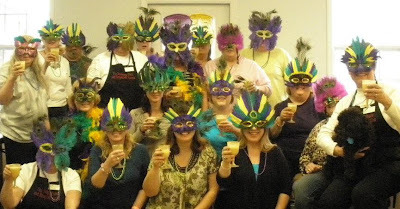 They were having a Mardi Gras themed crop and we stayed there all night - I left Libby there around 11pm - she stayed until midnight. This store has the best crops - when we got there they had seats for us with jester hat name tags and plastic Mardi Gras cups filled with candy and a mask. 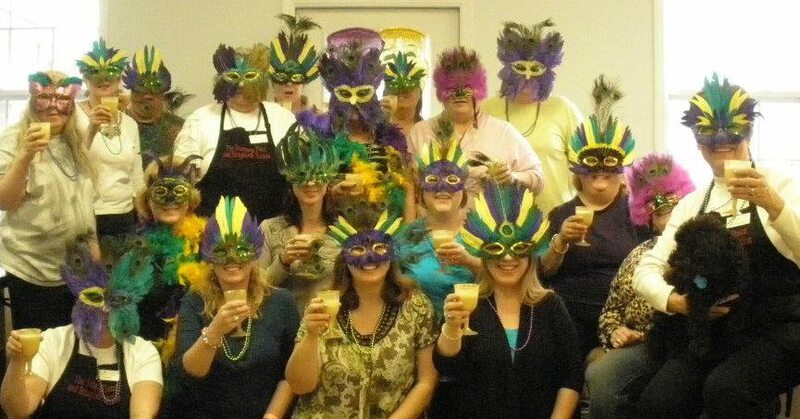 Later on they brought out a delicious Mardi Gras pound cake and took a picture of the group wearing some fabulous masks. 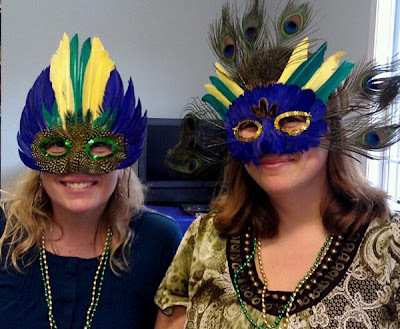 They had the picture developed and gave us all a scrapbook page to make for the crop that included a hand made one of a kind glittered mask that the ladies there had painstaking made for each of us. It's just a fun place!! Libby had so much fun she decided to stay a little longer and signed up for the crop again for Sunday. I stopped by and had lunch with the ladies Sunday and cut some paper for my upcoming card classes there. Libby and I had a great time and it was nice to finally meet an online friend in person!! Here are some pics of the weekend. Ready for the big group photo! 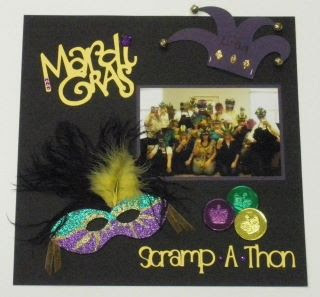 The scrapbook page they had ready for us to create!! Yummy and beautiful Mardi Gras pound cake! Late night creating with Libby! Looks like your had an amazing day!! LOVE those masks and your fun LO! Hope you didn't spend too much..... lol! that looks so so fun! and how great you got to meet your bloggy friend :) The pictures look great, wish there were more fun crops around my city... i have never been to one before!